Because again what’s important is what he feels, not honoring the victims. Better to be obnoxious to them and try to push a gun law that wouldn’t have stopped it. 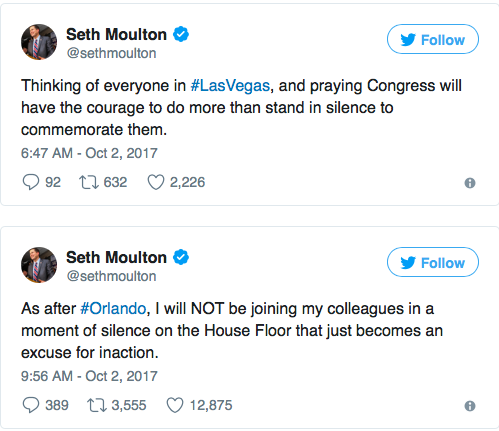 Massachusetts Democratic Rep. Seth Moulton announced he won’t partake in the moment of silence on the House floor for the victims of the mass shooting in Las Vegas Monday, arguing Congress should instead be taking action on gun control. A gunman killed at least 50 people and injured more than 400 after open firing at a country music festival Sunday evening. Moulton took to social media to call for lawmakers to act on gun control legislation. The Massachusetts Democrat noted, following the mass shooting in Orlando, he and his colleagues said it likely wouldn’t be the last instance of violence.